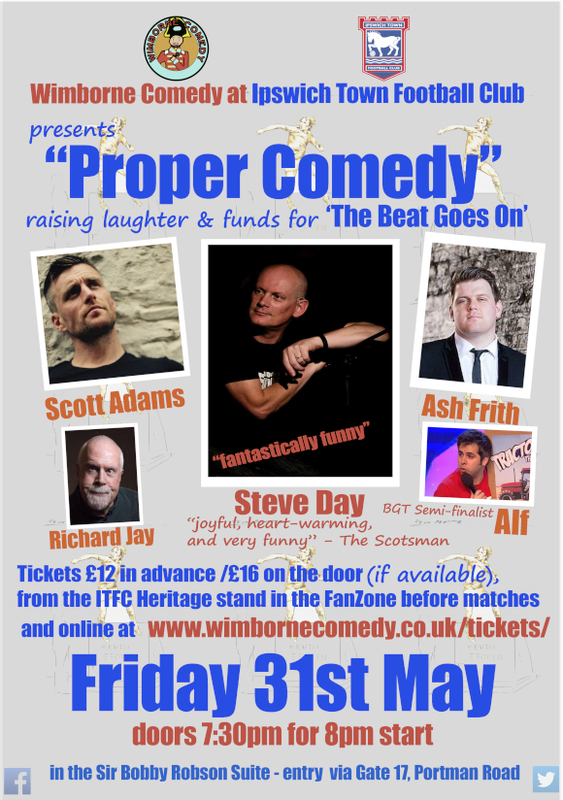 Tickets for Proper Comedy, the night of comedy at Portman Road's Sir Bobby Robson Suite on May 31st raising funds for the Kevin Beattie statue, will be on sale in the FanZone prior to today’s game against Birmingham City and are also available online. The evening will be headlined by Steve Day, who was a regular at Portman Road during the Bobby Robson era. Day’s website describes him as “a truly unique comedian - warm, witty and engaging whilst dealing with the dilemmas of being a deaf man in a hearing world”. “It’s an honour to be asked – I lived for a while in Lowestoft and loved watching Kevin and the other greats of Sir Bobby Robson’s day,” he said. Then on stage prior to headliner Day will be Alf, a Devon-based prop comedian, who was a semi-finalist on Britain’s Got Talent in 2018. Tickets to the over-18s only event will be available from Liz Edwards on the ITFC Heritage stand in the FanZone before today’s game and at the Swansea and Leeds matches, while they are available online here. They cost £12 in advance or £16 on the night. Led by the EADT and Ipswich Star in conjunction with BBC Radio Suffolk and TWTD, The Beat Goes On campaign was launched on December 18th last year on what would have been Beattie’s 65th birthday.